Today, XML is the industry standard of fast and efficient data exchange between various solutions. However, there are numerous situations when users need to represent XML data in an alternative form and that is exactly when additional tools are required to bridge the gap between XML and one of the popular tabular formats. If you face the problem of converting XML data on a regular basis, make sure that Advanced XML Converter is on your list of must-have applications! The latest version of Advanced XML Converter provides a simple, fast and highly efficient way to extract data from XML files and save them in one of the popular formats, such as HTML, DBF, CSV, Excel and SQL. 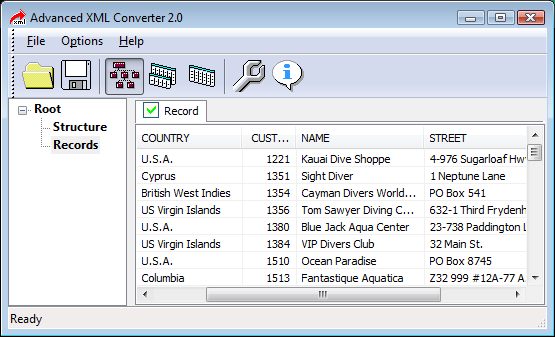 With Advanced XML Converter, you can extract all XML data or data in specific tags only, instantly switch between various modes of data representation (no reparsing required), specify custom exporting parameters for each output format (for instance, HTML table styles and CSV delimiters, fields, tables to be exported and other parameters), save all the tables to a single file or save them into individual files, as well as customize preview and output options in a number of other ways. The software does not require any additional drivers or components, as it uses the standard Internet Explorer parser found on the majority of end-user systems, does not require the .NET framework or XML schemas. Advanced XML Converted requires no deep knowledge of the XML file structure and greatly facilitates conversion of large volumes of XML data. As a user, you will be able to see even the most complex XML documents in several tabular representations that are easy to read and work with, which comes very handy for data migration to databases and specialized systems requiring the plain text format. If seeking a lightning-fast XML data conversion tool with flexible output options, choose nothing but Advanced XML Converter. Affordable and intuitive, it will make complex data conversion tasks a matter of minutes! XML converter,xml to csv,convert XML to CSV,XML to CSV converter,xml to xls,xml to html,xml to htm,xml to excel,xml to database,xml to sql, xml to MySQL,xml to dbf For lightning-fast XML data conversion with flexible output options, choose nothing but Advanced XML Converter! Affordable and intuitive, it will make complex data conversion tasks a matter of minutes and will always produce excellent results.